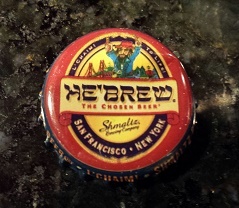 Shmaltz was founded by Jeremy Cowan in San Francisco in 1996. It was contract brewed until the spring of 2013 when a new 50-barrel brewhouse opened in Clifton Park, New York, about ten minutes north of Albany. For a time there was a second line from the company, The Freak Beers from Coney Island Craft Lagers, including Mermaid Pilsner, Human Blockhead Imperial Bock and Albino Python White Lager. But this was sold to the Alchemy & Science subsidiary of the Boston Beer Co. (Samuel Adams) in August, 2013. So now the company concentrates on its He’Brew line, The Chosen Beers—Messiah Brown Ale, Hop Manna IPA, Genesis Dry Hopped Session Ale and others. 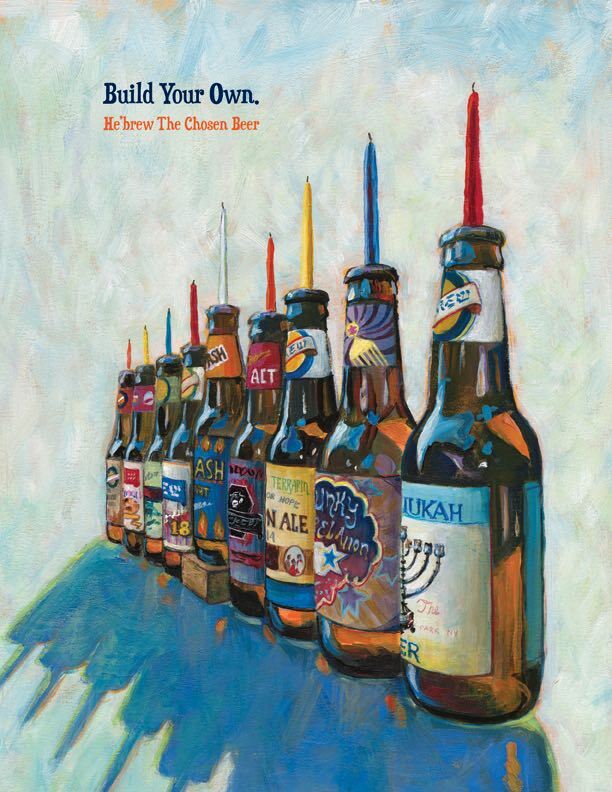 Sundown was 4:17 pm in these parts today, so that’s when I poured the new Hanukkah, Chanukah Pass the Beer, a name that may (or may not) allude to the lyric, “Chanukah, Chanukah, Spin the dreidl round.” In any case, the beer is virtually opaque unless held to the light of more than a single candle, when some garnet hues glow in the glass. Alcoholic vapors come right out of the glass, too, along with woody, dark cherry and toffee aromas. It’s a velvety, mouth-coating beer, but not too sweet, with a drying, lightly tannic finish. 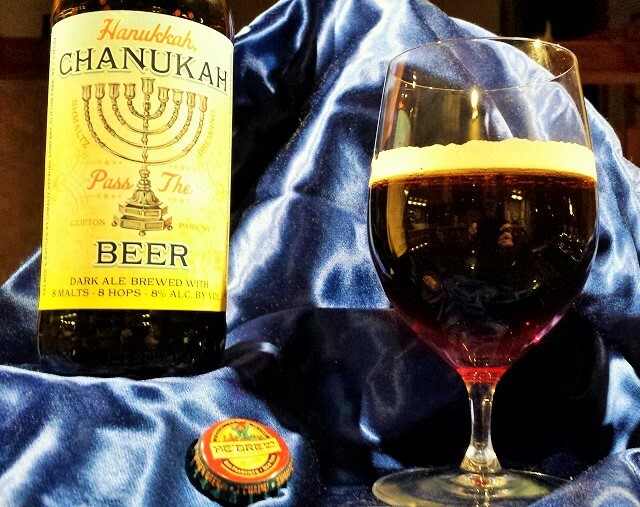 Given eight nights of Hanukkah the beer is 8% ABV with eight different hops (Warrior, Chinook, Fuggle, Vanguard, UK Golding, Centennial, Willamette, Liberty) and eight different malts (2-Row Barley, Carapils, Dark Crystal, Chocolate, Victory, Flaked Oats, Wheat, Munich). With those eight nights ahead you’d be all set with two four-packs. But the brewery also packages, naturally, an eight-pack of eight different beers–the Fifth Annual He’Brew Gift Pack, including Rejewvenator, Death of a Contract Brewer, and Jewbelation 18—complete with a poster of a painting by artist Jennifer Maher suggesting a menorah of nine beer bottles would be perfectly appropriate. Shmaltz produced the first Jewbelation (Miraculous Jewbelation) in 2004 to celebrate its eighth anniversary. It was an 8% ABV beer with eight different hops and eight different malts (not unlike this evening’s beer). 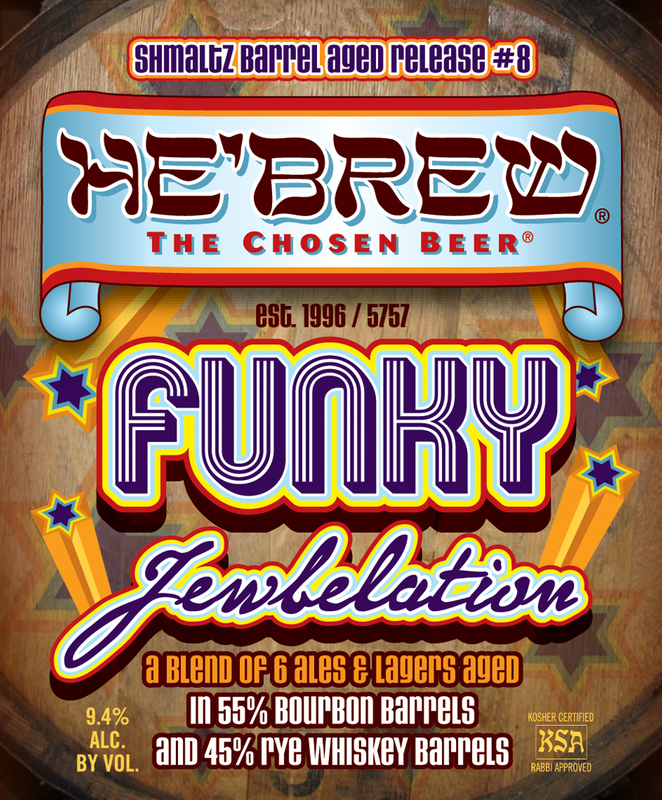 But the Jewbelation kept escalating each year—a 9% brew with nine malts, nine hops and so on, until last year’s whopping 17 percenter, Jewbelation Reborn, with 17 malts and 17 different hops. I have one bomber of this down in the cellar, but haven’t dared open it yet. I’m still recovering from the 2012 version, called Sweet Sixteen. This year someone said, “Enough already,” and scaled the Jewbelation back to what Cowan laughingly called a “sessionable” 12.4% ABV. I had one lone 12-ounce bottle of the Hanukkah, Chanukah that I polished off before dinner, and I was already having a festival of lights. 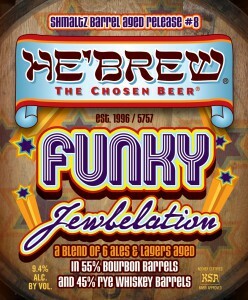 I also had a 2013 Funky Jewbelation in the cellar, and I pulled this one out to continue the theme while making dinner, during dinner, and with chocolate after dinner. And my feelings for it changed throughout. It’s a wild blend of six beers aged for varying lengths in bourbon and rye barrels, including a couple no longer in the company’s portfolio, the Coney Island Lager, and Albino Python. The ales were the Messiah Nut Brown, Bittersweet Lenny’s R.I.P.A., Origin Pomegranate Strong Ale and two differently aged batches of Jewbelation 15. A touch of Brettanomyces yeast provided the funky part. Let’s keep it simple and say there is a kaleidoscope of flavors swimming in the depths of this dark reddish brown brew. But unlike the Hanukkah, Chanukah, this one struck me at first as highly vinous and simply far too sweet to tolerate. I didn’t like it. But, if not precisely like the Maccabees, I persevered. With a fairly kaleidoscopic omelet in its own right the beer started to grow on me, a tart cherry flavor revealing itself and the funkiness overcoming the sweetness. It seemed to be transforming itself into a Flemish Red as time went on and the beer warmed up. With the chocolate it began to seem quite sublime. Of course, it is a 9.4% ABV beer, so as time went on I was warming up a bit, too, and my senses, no doubt, beginning to spin round like a dreidl.